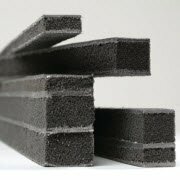 Our intumescent joint seals expand when exposed to heat. This expansion seals the joint, and prevents fire from spreading to adjacent compartments. Two hour rating. Tested to EN 1366-4, E 120, E1120. Constructed from elastomeric foam and laminated with an intumescent, graphite-based coating on both sides. Suitable for both horizontal and vertical applications. Water resistant and flexible. Each seal is made to order. Delivery may take up to 14 working days. Fire resistance testing to EN 1366-4 E 120, EI120 and BS 476 240mins.